My Creative Time: Show Me Your Technique & Guest Designer for "The Cuttlebug Spot"! Show Me Your Technique & Guest Designer for "The Cuttlebug Spot"! GOOD MORNING my creative sweet friends! Well, today I have 2 posts in one for you! First of all, I am very honored that my super sweet friend, Miss Jannie had invited me to be a guest designer on the "Cuttlebug Spot" today! She had asked me to do a fall 3-D item & this is what I came up with! I used my "XL Label die" & cut it out w/some "Balsa Wood". Next I ran it through my cuttlebug using the "Swirls" cuttlebug embossing folder! Then I stamped the border onto the label using the "XL Label Border" stamps. 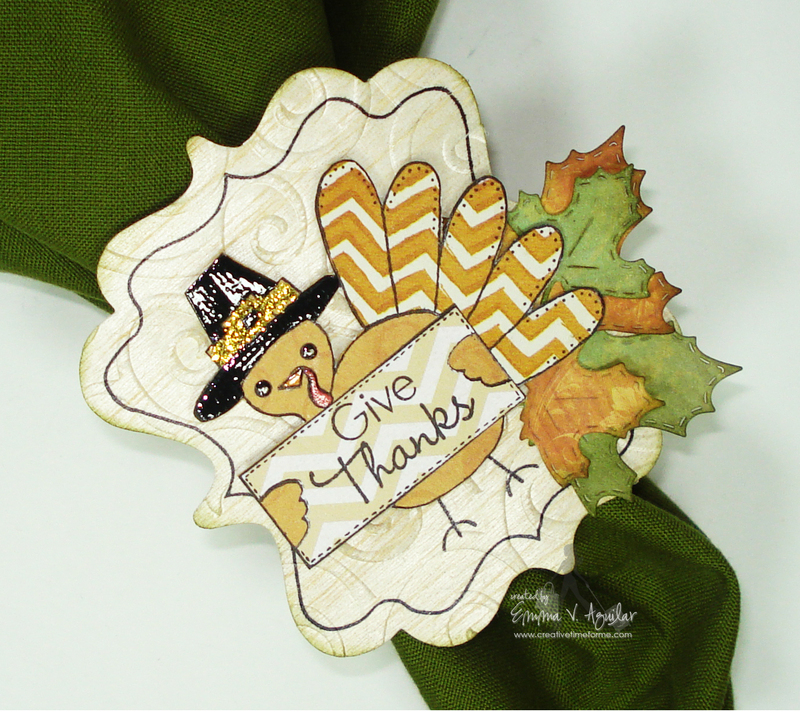 Lastly, I added my cutie patootie turkey & leaves from my "Piles of Smiles" stamp set! I just attached it to an old napkin ring I already had! I hope you enjoyed my "Cuttlebug Spot" project here today! OKAY, are you ALL ready for another "Show me your technique"??? I sure am & I can't wait to hop w/you! Here is today's line up for this mini FABULOUS hop! After you are finished hopping, leave some love for my design team, then head back here to let me know if you learned a NEW technique today! Thank you for stopping by & have a FABULOUS day my sweet friends~! You can run balsa wood through the cuttelbug? Oh sweet! I've got a stack in my stash... will totally be trying this!! Thanks! PS. Gorgeous project :) Love the colours! This is so adorable, Emma! I love the embossed balsa wood! Love the embossed balsa wood. Just have to try this. Masking and making napkin paper...not to mention the fun die cutting and embossing that can be done with the Cuttlebug :D Too much fun! 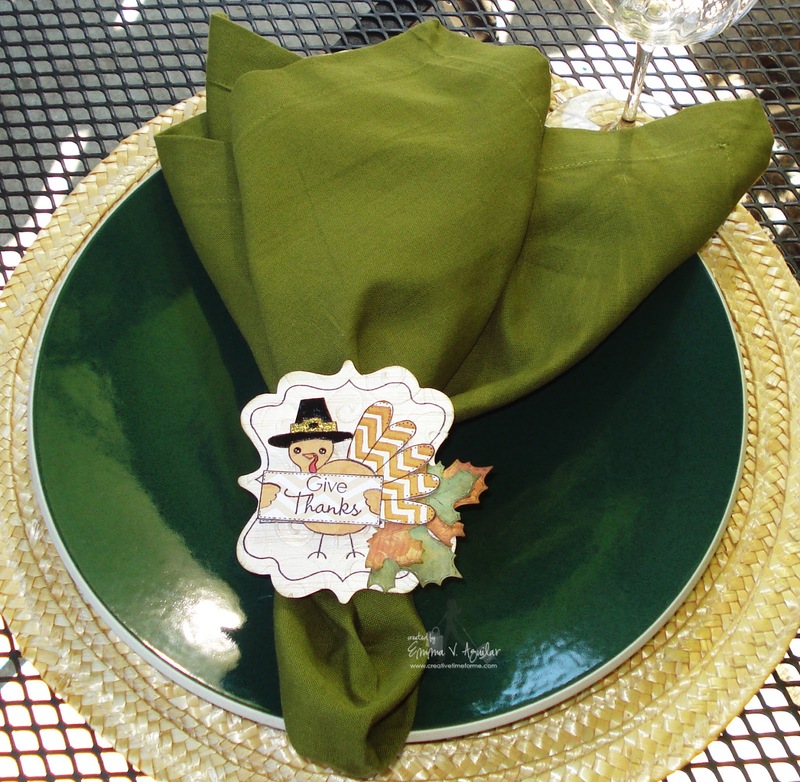 Your napkins rings will be a big hit on your Thanksgiving table. Thank you so much for being our guest designer at The Cuttlebug Spot Miss Emma!! Emma ~ Oh this is just too SWEET!!! 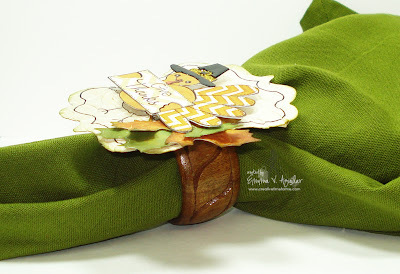 I LOVE that you used the XL label die, balsa wood and that turkey to make these napkin rings! LOVE!!! Oh where did you get those plates too?? LOVE the Cuttlebug Spot ~ great dting!!! Oh the DT's did an INCREDIBLE job! I learn something new every Tuesday!! They really ROCKED!!! Emma, love your napkin holder decoration, especially because it is part wood. The Design Team did an amazing job and I usually learn a little something on Tuesdays, today was Cathryn's idea using napkins for paper. I also loved Cassandra's tip for finding new sentiments. WOW, Emma, thanks for sharing this!!! If you don't mind me asking, where do you get your balsa wood? I have tried running it to my cuttlebug before - mine I got from AC Moore and is about 5mm thick-, with no luck a lot of split areas :( Maybe I don't have the right sandwich! ?, any help you can provide is GREATELY apprecciated! Congrats on your a Guest Designer spot. Keep on shining!!! Thanks for all you do and share with us! Off to hop I go, have a wonderful day! This is the cutest little napkin holder ever! I love it! I love the embossing!